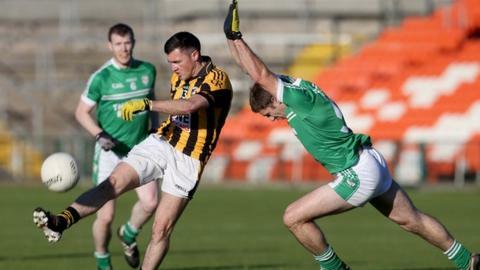 Second-half goals from Johnny Murtagh and Johnny Hanratty helped Crossmaglen to an Ulster club quarter-final victory over Cargin at the Athletic Grounds. Antrim side Cargin led 0-4 to 0-1 and they should have been ahead at half-time but went in level at 0-7 each. Murtagh's goal put Cross five points up and Hanratty clinched the win with a second minutes from time. Cargin's challenge faded after the dismissal of Gerard McCann for two yellow cards after 52 minutes. Ciaran Close was a late inclusion in the Cargin starting line-up and he scored three of their opening four points. Hanratty burst through the middle for Cross' sole score after six minutes. Tony Kernan (free) and Mickey McNamee got Cross back into it and Cargin squandered several opportunities to stretch their lead, hitting four first-half wides and dropping a couple of efforts short. Michael McCann then scored a 40m point to put Cargin 0-7 to 0-4 ahead in the 28th minute. Cross moved Rico Kelly to midfield and the six-time All-Ireland champions reeled off three quick-fire points before the interval. Frees from Aaron and Tony Kernan reduced the gap and in first-half injury-time, Mickey McNamee capitalised on a poor kick-out and pointed from close range. Aaron Kernan popped over a left-footed free on the restart to put his team in front for the first time before his brother Tony converted a '45'. Cargin lost possession around their own '45' and Murtagh ran through, unleashing a fierce shot which flew past the keeper's outstretched left arm to give Cross a 1-10 to 0-8 lead. The Antrim champions refused to buckle and Michael Magill led the fightback with a '45' and a superb score from the wing. They were within a score, trailing 1-13 to 0-13, with nine minutes remaining but the sting went out of their challenge after McCann was sent off for a second booking. Stephen Kernan made sure with a composed point and then delivered a clever low pass in to Hanratty, whose confident finish set up a rematch against Down champions Kilcoo, who defeated them after a replay in 2013.